Robotic process automation (RPA) is one of the fastest-growing sectors in business, but it can deliver even more benefit to users with an injection of breakthrough tech. Enter intelligent document processing (IDP), which uses machine learning (ML) to capture, classify and extract the most difficult to automate data: unstructured. IDP fills the wide capability gap left by rules-based RPA, which pulls and pushes structured data — and this capability is finally getting the attention it deserves as an enterprise technology superpower. Everest Group is among the first firms to map the market and recognize its leaders, and in their latest assessment of the landscape, they have designated WorkFusion a Leader based on Market Impact and Vision & Capability. 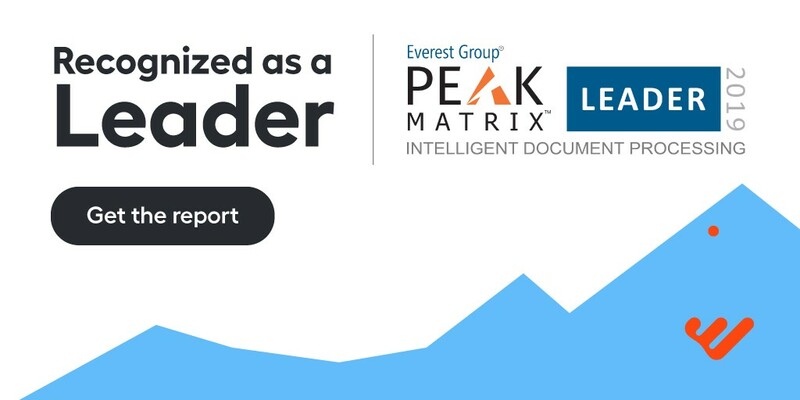 We’ve licensed the report — Everest Group’s Intelligent Document Processing PEAK Matrix™ 2019 — which includes the full vendor evaluation of WorkFusion. Download a complimentary licensed copy here. Read on for highlights of the report and why WorkFusion was spotlighted. What is intelligent document processing (IDP)? According to industry research, about 90% of data within any organization is unstructured, and most of it is locked in documents. Everest defines documents as “email, text, PDF and scanned documents” — which first-generation, rules-based RPA cannot process. IDP has emerged as a critical capability for large organizations because RPA customers have struggled to scale automation programs, most of which require processing a large volume of documents. With IDP, operations are able to automate data capture, classification and extraction. Why is WorkFusion a Leader out of 16 IDP vendors? WorkFusion has created the best iteration of each capability and built them into a unified software platform so that rather than cobble together multiple point solutions, customers only have to buy and learn one great product. Not too long ago, AI was complex, expensive and scarce. WorkFusion was founded to make AI easy for business people — and the success that leading banks, insurance companies and healthcare organizations have seen using our product suggest we’re meeting that goal. How? The key is a proprietary native capability called AutoML, which automates the expensive, complex data science work that used to require a team of Ph.Ds to spend months cleansing data, selecting and testing different machine learning models. AutoML watches people do their jobs, finds and learns patterns, and selects and trains the right algorithm to automate the work… within days. One example of a pre-built package: Anti–money laundering (AML) efforts are complex and expensive, but necessary to ensure banking customers are not performing illegal financial activity. Along with two major services partners, WorkFusion decided to create an off-the-shelf AI-driven automation solution for AML. RPA, OCR, BPM and AI have each been around for a while, but our breakthrough automation capability has combined and delivered them as a unified product for customers. This is truly versatile intelligence: making many different tasks in a process more accurate, more measurable and more predictable. Entire functions are not only automated, but also perform better, faster and more efficiently as volume and variability of work increases. Our recognition by Everest Group as a leader in IDP, in two significant dimensions (Market Impact and Vision & Capability) is proof that one powerful, versatile platform that creatively combines capabilities can outperform specialized, rigid point tools. Our vision since 2012 has been for our customers, and we’re grateful to every company who has bet on us and helped us blaze this trail — and those who will continue to leap forward with us.